In an eloquent and poetic tour de force, these photographs from the Eastern shore and of boots stuck on barbed wire fence posts in Nebraska provide traces of human endeavor and ritual, traces in various stages of decay, on their way back to the natural elements. The abandoned state is not repellent. It is dignified. There is a Zen-like acceptance of this inevitable transformation. Szabo virtually speaks to viewers (maybe to himself) through these works, each one evenly repeating: Let it go. This is not an exhibition of portraits, but it is an exploration of people, faceless folk who have left a mark – an object – to weather the elements, not really saying, “I was here,” so much as saying, “Now, I am somewhere else.” The works are all about the human venture to manifest in ritual and ceremony then move on, leaving a trace, an unprotected trace. There is nothing casual, disdainful or disrespectful about the abandoned trace. Tibetans traditionally perform sky burials, which involve abandoning the deceased on a platform to be devoured by vultures. No pyramid for royalty (and mass grave for the rest? ), the surrender to nature is a final gesture of modesty, humility, and respect. Instead of finality, these images explore continuity. Part detective, part archeologist, the artist Steve Szabo provides photographic traces of the traces, platinum prints that tell viewers Steve was there. In connecting viewers with these not-personally experienced signs of anonymous decisions, Szabo provides insight both into the worlds he explored and himself as an explorer. Born in 1940, Steve Szabo was a native of Berwick, Pennsylvania and worked in the Pennsylvania steel mills. Though he attended Penn State University and the Art Center School of Design in LA, he was basically self-taught. He was employed at the Washington Post as a part time photo lab assistant in 1962, then staff photographer 1966-72. In 1972, he took a 6-month leave of absence to get away from the hectic world of photojournalism to devote some time to photographing the landscape in Somerset County, MD. Instead of 6 months, he worked on the Eastern shore from 1971-1976 and produced the fine art platinum prints that became his first published book of photographs. In these photographs, the lingering traces of human presence and activities silently persist though the natural elements steadily attack and replace them. Before beginning the abandoned boot series, he worked in DC, France, Scotland, Hungary, and Hawaii, producing several bodies of work and publishing additional books. In Hawaii, he photographed ruins of ancient temples, another angle on exploring the passing of time. At one point, he produced sets of multiple images, complementing the sense of place with a sense of time. 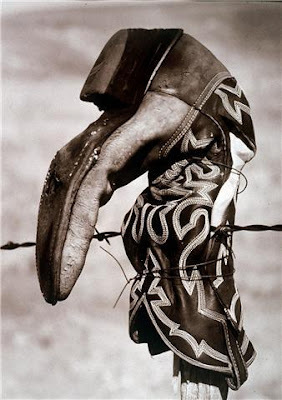 In 1990, Sazbo began photographing abandoned boots stuck on fence posts in Nebraska. The images of boots unmistakably evolved from previous series exploring traces of now-forgotten rituals (the ruins in Hawaii) and human presence succumbing to natural decay (Eastern shore images). However, the images of the abandoned boots take on a more private, personal quality. He never learned why the boots were there or if they were supposed to mean anything. He never explained why they fascinated him, maybe did not know himself. His enthusiasm and attentiveness to the isolated, weathered boots produced a body of work that, as a whole, have become traces not just of boots but of a man’s drive and curiosity to manifest and, before moving on, to leave a trace. Seeing Steve Szabo's platinum photographs from his "Eastern Shore" series in 1975 was my introduction to fine art photography. I was intrigued by the combination of documentation and personal vision he conveyed in his images of the desolate rural Maryland Somerset County. From that beginning, I began to learn about the great history of photography and the masters like, P.H. Emerson, Walker Evans and so many others which had influenced Steve as he transitioned from a photojournalist at the Washington Post to a fine art photographer and teacher at the Corcoran School of Art. The exhibition at Harmony Hall is significant on several levels. The photographs on view are from his first series as a fine art photographer, "The Eastern Shore" from 1971 to 1976 and his last series, "Icons of the Great Plains" dating from 1990 and 1991. It is fascinating to see where Steve began and where he ended his photographic career. 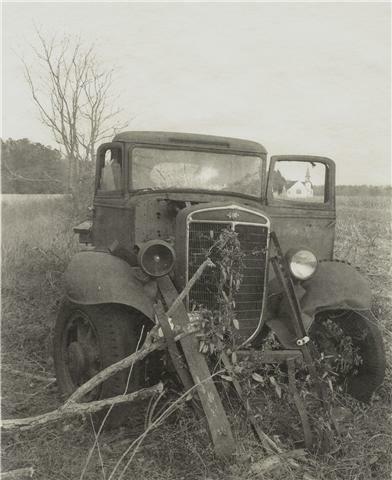 "International Truck, Frogeye, Maryland," from Steve Szabo's "Eastern Shore Series"
For the "Eastern Shore" series, Steve used a large format, 8x10 inch view camera to document the rural areas of Somerset County. It was a cumbersome task to carry the heavy camera and a strong tripod into the woods and fields to capture an image. Steve's approach was to photograph the scene just as he found it; never making any changes or alterations. I'm sure he circled the abandoned International truck several times before he decided to let the window of the open car door frame the Ebenezer Baptist Church off in the distance. Later, Steve seemed to think the image was too predictable and contrived. Personally, I felt it was a serendipitous moment and the framing of the church in the truck window greatly enhanced the image. As well as years devoted to exploring art, Steve Szabo was also an art educator who influenced many a DC artist in his classrooms starting in 1979 (Diekmeyer was one of his students). Diagnosed with multiple sclerosis in 1992, he continued to teach until 1994 and passed away at home May 18, 2000. This show is on through Through May 29th 2010. After the exhibition closes, the works can be seen by contacting Kathleen Ewing. Harmony Hall Regional Center is located in Southern Prince George's County and offers classes in the visual and performing arts as well as exhibitions, concerts and performances. Well.. she's been picked up by Irvine Contemporary and has a show opening Saturday, June 19, with reception from 6-8PM.